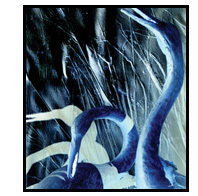 Silent Shadows is based on a collaboration with Operation Migration to create a series of art prints based on original images of the whooping cranes migration. The prints depict the shadows of the whooping cranes across the landscapes of the Heartland to the Gulf coast. 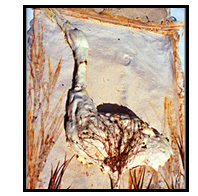 Shrouds for an Endangered Species are an elegy to the endangered whooping cranes of America. Here a cast was made in clay and plaster. Plant materials were gathered from the former habitat of these endangered birds to be formed into handmade paper which was pressed on to the mold to create Shrouds for an Endangered Species. 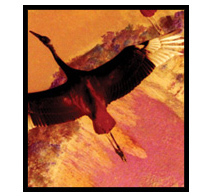 Spirits of Whooping Cranes are a memorial to the endangered whooping cranes of America. Here a full cast was made in clay and plaster. 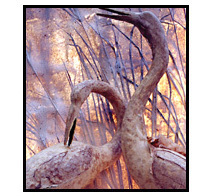 Plant materials were gathered from the former habitat of these endangered birds to be formed into handmade paper which was pressed on to the mold to create the three-dimensional Spirits of Whooping Cranes. 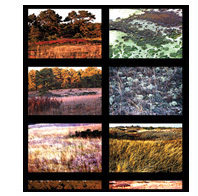 As artist in residence at the Necedah national wildlife refuge, Joseph completed this series of works to be returned to their native habitat and placed on display. 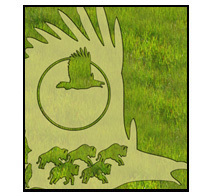 Icons of the Vanishing Prairies is a series of designs used to communicate concern for the endangered American Bison, Gray Wolf and Bald Eagle. The designs were cut into the edge of the tall grass prairie as a monumental earthwork and public advocacy for the protection of vanishing landscapes and endangered species. 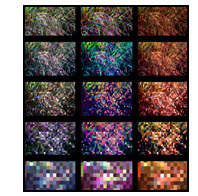 Panicum Virgatum Mosaic depicts the color progression of the prairie panic grass in a progressive mosaic of color. Within the prairie lie wetlands full of color and life. This work is part of a series which celebrates the remarkable beauty and utility of this wetland landscape within a sea of grass on the edge of the savanna. The Sand Plain is a xeric landscape of pine, bayberry, andropogon grasses and claydonia lichens. 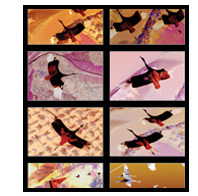 This mosaic of landscape is based on aerial and ground level photographs. 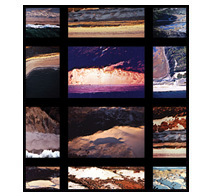 The Coastal Sand Dunes series depicts the additive and subtractive qualities of the Atlantic coastal dunes system. 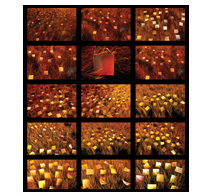 This work is a mosaic of aerial images shot through the seasons and over the years. 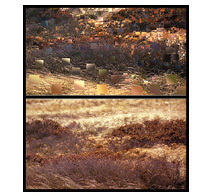 The Sand Dune Mosaic is a representation of an installation of color palettes which capture the colors of the season within the grassland of the sand dunes. This particular work accentuates the metallic range of colors found only in winter. 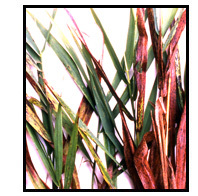 Leaves in Grass capture the seasonality of the salt marsh with a series of hand made color palettes, interwoven within the autumnal salt marsh grasses. 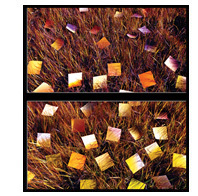 The color palettes were made from gathered salt marsh grasses and Japanese fibers to create the paper which was hand tinted to represent the field charted colors.